The long-awaited new stand - nearly finished, as I write - will apparently be open when we host Slough Town (and the second Maidenhead Beer Festival) at York Road later this month. 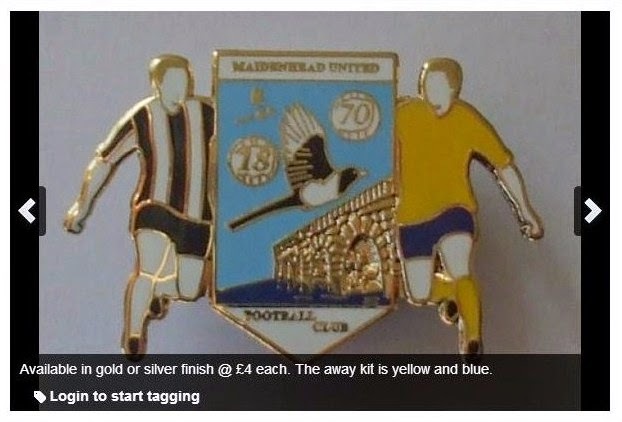 I’m reliably informed that the badge below is not - repeat NOT - a commemorative release celebrating this friendly match (despite a yellow and blue-kitted Slough Town player included on one side). Seriously, who came up with this abominable design?! I’m very tempted to purchase the entire lot - I assume none have yet been sold - only to MELT THEM ALL DOWN! And breathe. Perhaps this is an opportune moment to reminisce about the ‘good ol days’ (when our away kit was blue), heading over to ‘From Bell Street End to Boardroom’ for a misty-eyed nostalgia fest of the highest order (featuring Born & Bred articles written by GMOSC’s very own Macleod M … and at least one photo of him, alongside a similarly blazer-less KSG Trev). Yeractualfancultureinnit.